A: Breakpoint is a demoparty made by, and for, the demoscene. 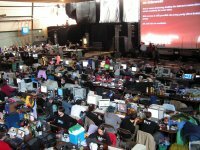 A: A demoparty is -- on first view -- like a LAN party. Depending on the size, a few or hundreds of visitors may bring their computers and set them up at the location. 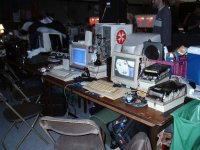 Unlike a LAN party, Demoparties have an emphasis on creativity. 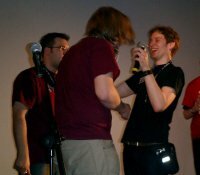 Attendants are encouraged to compete in scheduled competitions (referred to by demosceners as 'compos'.) These 'compos', spread out over the length of the party, are in categories that allow the attendants to showcase their artistic talents with the use of computers. In short: a demoparty is a multimedia art festival that usually lasts for several days. Q: What is the demoscene? A: The Demoscene considers itself as a loose connection of creative minds with passions of creating digital art. A 'demo' is created by groups of people, or sometimes single individuals, to DEMOnstrate their skills. The traditional skill base of the demoscene is considered to be coding, music, and design. A: The process of creating a demo does not actually require physical presence of the contributors; visual, logical, and aural data can be distributed to others without ever actually seeing the other contributors. Over the history of the scene, many different ways of contributing to the process and creation of a demo: telephone calls, written letters, electronic bulletin boards, and mailed floppy disks in the early days; today, telephone calls, emails, the internet. However, the scene is not just a technical forum; it is indeed a social experience. And as such, 'sceners' enjoy meeting with each other, catching up with old friends, making new friends - so there is a need for these 'meetings' which we call demoparties. 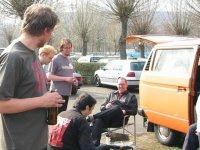 It is a place to meet and make friends (just imagine meeting hundreds of people with the same hobby and interests as you), to complete the last steps of your demo production together with your group, to exchange ideas - or just drink beer or socialize. Nevertheless the main focus lies with the so called "compos:" competitions where scene artists ('sceners') can participate and show their work in a friendly competition with others. Q: I'm not a demoscener, what's in it for me? A: We encourage every person interested in the demoscene to come to a demoparty, but you must understand that the whole community is about creating art and not just consuming. While it is not required to enter a competition, you'll be encouraged to participate in some way - and we believe at the end of the demoparty you'll leave and want to start on your NEXT demo - even if you've never created one before. A: There are many options to come to Breakpoint. If you live in an area where there are many sceners, you may be able to arrive by an organized bus trip. If you live a further distance away, you may need to arrive by plane, train, or car. Check with anyone you know who is a scener and see how they are traveling, and also check the travel pages on the Breakpoint webpage. Q: I'm only coming for a single day, do you have any single-day passes? A: No, we do not offer single-day passes, and we have a very good reason as to why. The entrance fee is used to finance the whole event - parts of the main party cost and competition prize money are paid from this. The costs of tables, chairs, and the rental of the hall are fixed. It does not make a difference if you stay 12 or 73 hours - the overall rental cost of these neccesary items is the same.. Participants rarely switch chairs or move about during the party - and our party hall is filled with tables and chairs. We need to have enough seats for everyone, and need to have them for the entire duration. If you, personally, do not occupy a chair the entire time, the chair does still have an associated cost. Having day tickets would encourage lots of unrelated people to show up at the party, for the real sceners this would give a "zoo"-like feeling. By requiring everyone to purchase 4 days of party, we reduce the participants to those who are really interested. 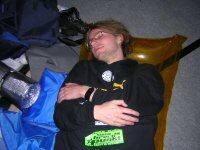 Some other parties in the past have tried selling single day tickets, and the results were not positive: Increase in theft, the 'zoo' effect contributing to a bad atmosphere, and multiple complaints to the organizers of the parties that this was simply not a good idea for the future. So if you really are interested in the demoscene, please try to stay during the whole party. You'll actually feel much better about it afterward, with a better understanding of what the experience was, and you'll have the time needed to really get into contact with tons of people. You'll become part of the party. Q: How is the overall environment at your party? A: Overall, the conditions you find at a party are not always optimal (cold, power breakdowns, loud noises) and can't be compared to your cozy home. Nevertheless, Breakpoint staff does great efforts to make the party as comfortable as possible for their visitors. Q: Will there be enough seats? A: Short answer: We have never yet run out of space. Long Answer: We try to provide as much space as possible inside as well as outside of the hall. Anyway, you should use space economically. While the hall looks rather empty in the beginning you might observe that it fills up continuously, as some visitors can only attend later, due to personal reasons or long travelling distances. Just pick yourself a nice place that isn't taken, but keep in mind that there will be other visitors that might need some space too. By the way, not everybody arrives with his computer. Q: What kind of people can I meet? Party-animal: Their intention is to meet friends and get to know other sceners, discuss demoscene-related stuff but also personal stuff. Such people are not necessarily lazy people, they might just have finished their releases in time and thus use the time at a party for the more relaxing things. In the hall, either on the grandstand or on the fluffy carpet under the tables. Bringing your own sleeping equipment (fluffy blankets, penguin cushions, sleeping bag, ...) is a good idea. You might consider that due to the almost constantly high noise leve, earplugs (free at the info desk) are a good idea in this case. In your car, if weather conditions allow for that. In case you don't want to forgo on any luxury we advise you to book a room at one of the hotels through our hotel reservation system, where you can get special rebates. As an additional luxury, the hotels are connected via our own shuttle bus. You will get dropped just in front of your hotel -- for free. Q: Can I take a shower? Are there enough toilets? A: As for your hygienic needs we provide showers (opened at announced times) and sufficient toilet facilities. Q: Is there any risk my equipment gets stolen? A: We do not provide any lockers so you have to keep an eye on your stuff yourself. Or just ask your table neighbour to watch for it. Sceners tend to watch out for each other in this manner. Still, if your neighbor is hard at work on a project, please consider that they may not be able to actually WATCH your stuff - so do make reasonable choices about this. What about locking your belongings overnight in your car? Q: How about food and drinks? Can I buy them somewhere? A: If you feel hungry or thirsty you have several options to satisfy your needs. First of all, there is a wide variety of food and drink support on site. A bunch of food stands will offer all kinds of food - including vegetarian food. Our staff also sells all kinds of softdrinks as well as beer at really reasonable prices. Other options are self-supply, by visiting one of the nearby supermarkets. A very successful idea in the past has been to take part in one of the barbecues outdoor done by some groups and contribute your own meat and sausages. Because the party is actually taking place over the holiday weekend, you should be aware of the holiday schedule for shops. You cannot buy food on Friday, Sunday or Monday- so you may bring it with you. Or try to work out a deal with a friend who arrives beforehand if you wish to get food from a local store for that day. Q: How can I take part in a competition? A: Visitors can hand in their productions, also called 'releases', (demos/music/graphics/videos/...) to take part in the competitions. All you need to do is check the schedule and turn in your 'release' to the infodesk so before the respective deadline. The infodesk is clearly marked, and several areas will be helpfully marked 'THIS IS NOT THE INFODESK.' Additionally, Organizers will be wearing shirts which make them easily identifiable from the other sceners attending, and they can point you to the infodesk. Just ask. The deadlines are set so that our staff has enough time to go through all releases and check if they work properly, as well as prepare the required screenshots. This also gives you the advantage that if there is a problem with your release, you can be informed and given a chance to fix it. That helps to avoid the disappointment of working hard on your production and not being able to see it, because it didn't work. The basic requirements for contributing your releases to a competition can be found in the competition rules on the party website. In most categories we won't have a preselection, as the amount of releases is still manageable. So even if it is your first release, don't hesitate to hand it in and see what the crowd thinks of it. During the competitions, usually most of the crowd gathers in the hall to enjoy the releases on the 'bigscreen.' This is a great chance for positive feedback on your work. Q: Who decides the winner in a competition? A: You do - that is - every visitor gets to vote for their favorite entries. Shortly after the last competition of the party, visitors can exchange the wristbands they received at the entrance for a voting-key. Via the party intranet or the terminal at the info desk, they can browse though all releases and pick their favourites. Finally, they submit their votes by entering their voting-keys. The last event of the party will be the prize-giving ceremony. This is where the final results are presented, and the three best entries in every category will be rewarded with prizes. Q: Is there any additional info on the internet?